1. If you follow my content on Twitter you will find it is primarily tips to help you integrate content marketing into your marketing plan and how to enhance your online visibility through effective digital marketing and social media marketing. 2. Most of the content I share on social media sites including Twitter is related to business, with little snippets of my personal life mainly at weekends. 3. I never re-tweet or share content that I have not reviewed as my objective is to share content that I consider to be of value to my followers. 4. When I am at an event or speaking at a conference I will often pre-schedule my updates including the hashtag of the event to provide additional resources for the delegates. The scheduling of the content will usually be planned to coincide with when I am ‘on-stage’. 5. I am often approached through direct messages or openly on Twitter to re-Tweet content. If you approach me please make sure that the content is relevant to my followers and is something I have shown an interest in – that is easy to work out if you review my social network updates. I am less likely to respond to your request if we have never met or connected in real life or online and if I see from your Tweets that you are requesting re-Tweets from many people in quick succession especially re-posting the same request. 6. Unlike some people you may follow, I don’t chat too much on Twitter nor do I regularly share #ff (Follow Friday). That is mainly because I am often with clients, researching new trends, attending events or perhaps writing a blog post or two and I am afraid I only have a certain number of hours in a day! 7. I may amend a re-Tweet to say MT (modified Tweet) to either make the Tweet more relevant to my followers or to reduce the number of characters in the Tweet. 8. I usually check Twitter twice a day to ensure that I respond in a timely manner to any questions you have posted – if you need to contact me urgently contact me by mobile phone or email..
9. I do not automatically follow people – if you have attended one of my workshops and would like me to follow you back please mention that in the Tweet. 10. My Direct messages are open so that you can easily connect with me. 11. Please note, I am more likely to un-follow you if I receive un-solicted promotions and ‘sales messages’ in direct messages. If you found my Twitter content policy of interest and have been inspired to create your own personal Twitter Policy, please do not copy my policy and indicate it is your own – if you develop your Twitter policy based off the above I would appreciate attribution in the spirit of good social media and online etiquette. 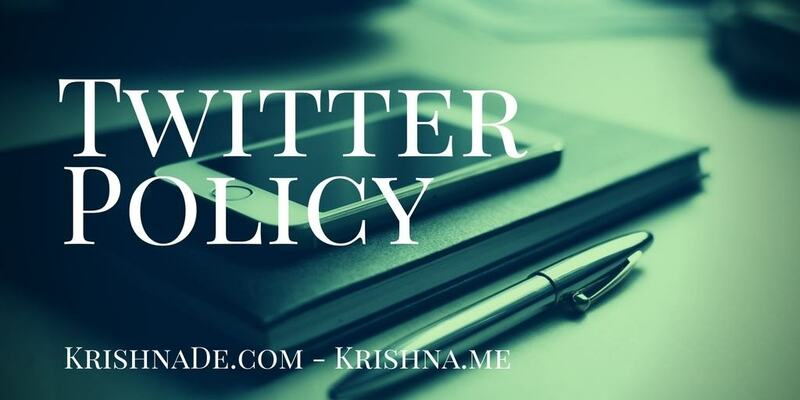 If you are looking to develop and communicate a Twitter Policy or social media policies for your organisation you can schedule a meeting with me here to discuss how I can work with you.